I just picked this photo off the internet, I didn't take it. 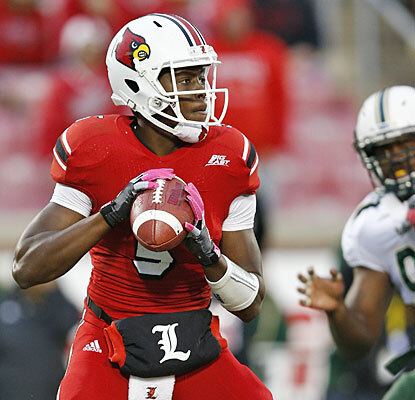 But it embodies Teddy Bridgewater, the 19-year old true sophomore Louisville QB perfectly. Note the steely eyes, the textbook grip, the perfectly centered hand warmer and towel. It's not surprising at all, when he takes everything about the quarterback position so seriously. His coaches praise his "next level" grasp of the position, mastering the art of play-faking and dummy signaling. He changes the offensive tempo, makes his own checks at the line, and makes his own calls in the no-huddle. Bridgewater has even programmed the team's offense into his X-Box, so he has thousands of simulated reps under his belt to go with the thousands of actual ones. On Saturday, Louisville needed all of Bridgewater's poise and efficiency to edge the resilient South Florida Bulls 27-25, including leading the game-winning TD drive with 1:35 remaining. Bridgewater's statline was just as splendid as his attention to detail: 21-25, 256 yards, 2 TD and 0 INT. And add in 10 runs for 74 yards for good measure. The only thing more sublime than Teddy Bridgewater's performance was the postgame team dinner in Louisville. Jack Fry's was a Top 10 all-time meal. Louisville (7-0) is back on the menu next week, when Cincinnati rides south with the Keg Of Nails. Stay tuned.